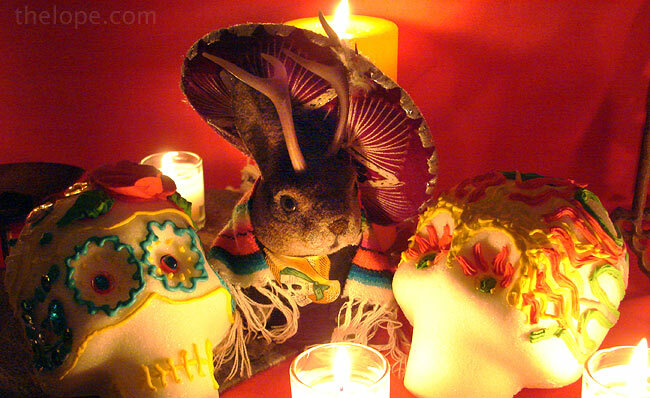 Happy Dias De Los Muertos (Days of the Dead). November 1 and 2 are both celebrated in some Hispanic cultures as days of remembrance for dead children (Nov 1) and dead adults (Nov2). 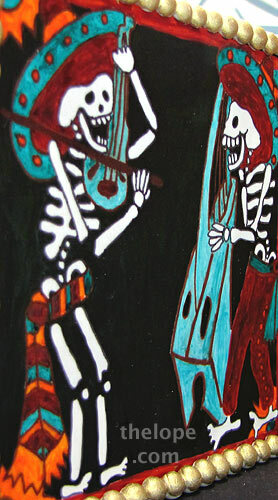 More commonly, November 1 is remembered simply as the Day of the Dead. 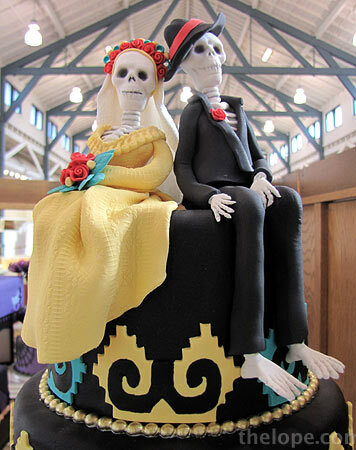 Each year I try to find examples of Day of the Dead artwork, and this year I mined the treasure trove of the Kansas State Fair and found this cake in the Domestic Arts building. It was part of an exhibit of cakes made for this year's theme, Things that go Bump in the Night. This cake is the work of Roberta Graham of Harper, Kansas. The bride and groom were handmade out of gum paste and fondant. Petal dust was used to shade the rib cage for depth. 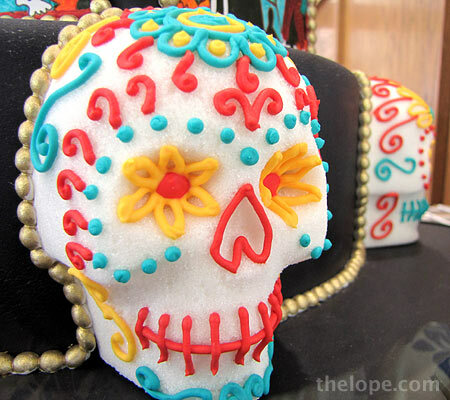 The six sugar skulls were made with the traditional Mexican method out of granulated sugar and then set out to dry for a few days. Royal icing was used to make the individual folk designs. Edible ink markers and food coloring were used to recreate actual Mexican tile patterns on very thin layers of gum paste, as in this photo and the one at top. 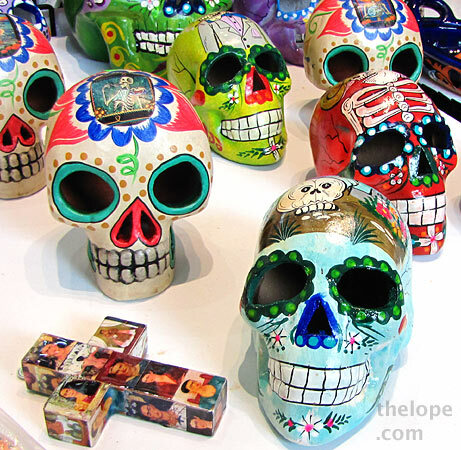 Another state fair, this one being the State Fair of Texas, offered Day of the Dead merchandise, such as these ceramic skulls. 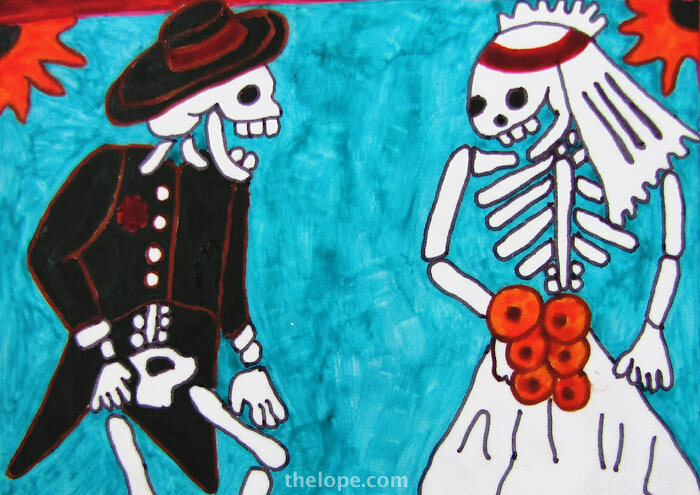 Read more about the evolution of the holiday in Happy Day of the Dead. 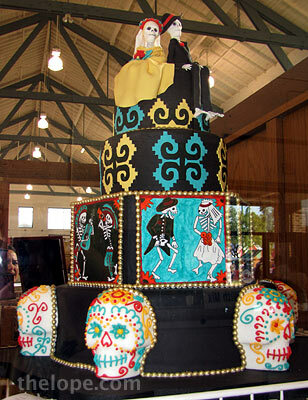 In 2008's Day of the Dead, we looked at a festive display at a Hutchinson business.